In what is believed to be the first infection outside of Africa, an assistant nurse at a Madrid hospital where two Ebola patients died has contracted the virus herself, health officials said Monday. The woman works at Madrid’s La Paz-Carlos III hospital where two missionaries who were repatriated from Africa with Ebola died from the disease, a spokeswoman for the hospital said. “We do not know yet if she treated any of the two missionaries,” the spokeswoman told AFP. 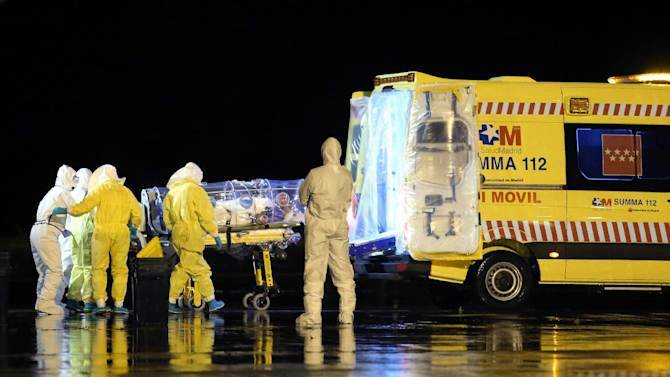 Spanish priest Miguel Pajares, 75, was infected with Ebola in Liberia and died at the hospital on August 12. Another Spanish missionary, Manuel Garcia viejo, 69, was repatriated from Sierra Leone and died at the hospital on September 25. There is no licensed treatment or vaccine for Ebola. Of several prototype treatments in the pipeline, one dubbed ZMapp has been fast-tracked for use, developed by Mapp Biopharmaceutical in California, in conjunction with the US Army. Posted on 6th October 2014 by newsafrica. This entry was posted in Africa, Ebola, Health, Sino-Afro Relations and tagged Africa, Charles III of Spain, Ebola, Ebola virus disease, Liberia, Madrid, Sierra Leone, Spain. Bookmark the permalink.